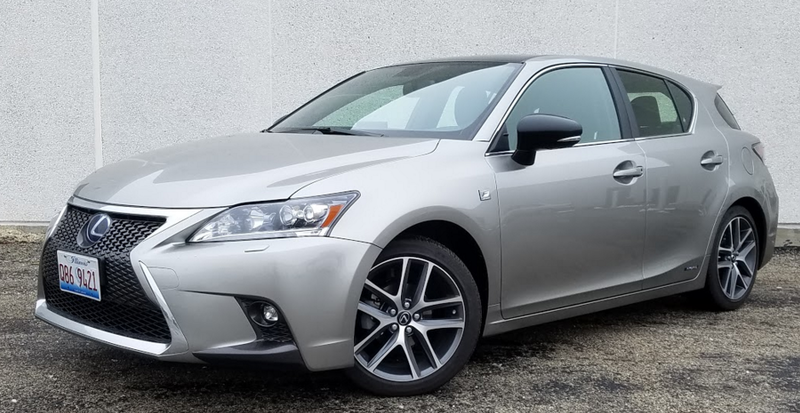 The CT 200h carries a distinct hatchback body style, and despite being a hybrid, it’s the lowest-priced vehicle in the Lexus lineup. Our tester started at $32,225 with destination, but options added nearly 10 grand to that. At least in F Sport trim, our CT 200h test car aimed at being a sport-luxury take on the mileage-minded hybrid formula. But it really didn’t hit any of those points very strongly. Part of the problem is that the Toyota Prius on which the CT 200h’s mechanicals are based has evolved into a really nice package itself, and one that sells for considerably less money. So to justify its premium, the CT has to offer something the Prius doesn’t. 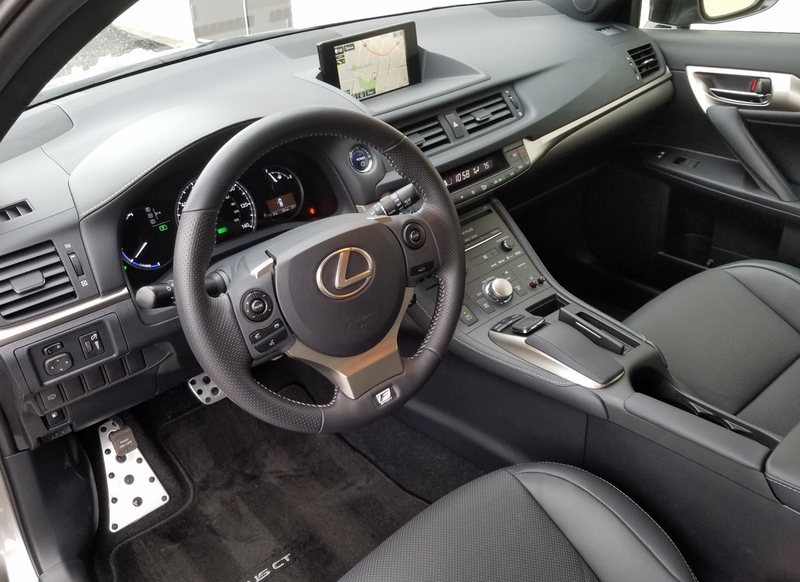 Beyond that, what the F Sport package adds — for its $3325 hit — is largely cosmetic, though it also brings rain-sensing wipers, auto-dimming rearview mirror, heated front seats, 4-way front passenger seat (a 10-way driver seat is standard), driver-seat memory, and HomeLink garage-door opener. That means you have to put a lot of value on the “sporty” touches such as perforated leather-trimmed steering wheel and shift knob (plain leather is standard), aluminum pedals, metal-tone instrument-panel trim, mesh grille, and a rear spoiler. But in some other ways, what Toyota giveth, Lexus taketh away. Most of that is in room — both for passengers and cargo. The F Sport package added — among other things — racy aluminum pedals and patterned matte-silver trim. Room in front is decent if you’re under 6 feet tall; in back … not so much. There’s decent space up front for average-height drivers, but I could barely fit my 5’9 frame into the back seat behind my preferred front-seat setting. The problem isn’t in headroom, which should be OK for those up to about 6-feet tall; it’s in legroom. Put a 6-footer in front, and the rear seat becomes a package shelf. (By comparison, a Prius is far roomier.) Visibility is good to the front and sides thanks to thin roof pillars, but it’s quite restricted to the rear corners despite little corner windows, as the rear headrests block the opening — unless the rear seat back is down. Furthermore, although the sun visor extends when swung to the side, it still leaves six inches of the side window uncovered. Interior storage space is also limited, as all compartments are quite small, and while there’s decent cargo space in back, the area is a bit restricted in height due to a high floor (and is notably smaller than that of a Prius). On the positive side, there’s a good amount of underfloor storage, and while the seat backs fold level with the cargo floor, they won’t unless the front seat ahead is far forward or the headrests are removed. As mentioned, the interior didn’t jump out as being luxury-car lush. Part of that may be due to our tester’s all-black color scheme that was set off only by the patterned matte-silver trim of the F Sport Package. 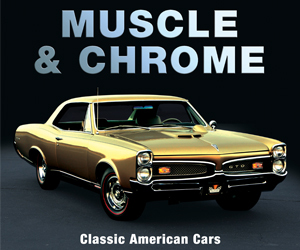 On the positive side, the dash top, door tops, and armrests were padded, but the overall look was — at best — subdued. That leaves the control layout. All climate adjustments are done through tedious repetitive-step pushbuttons, hardly the best for convenience. 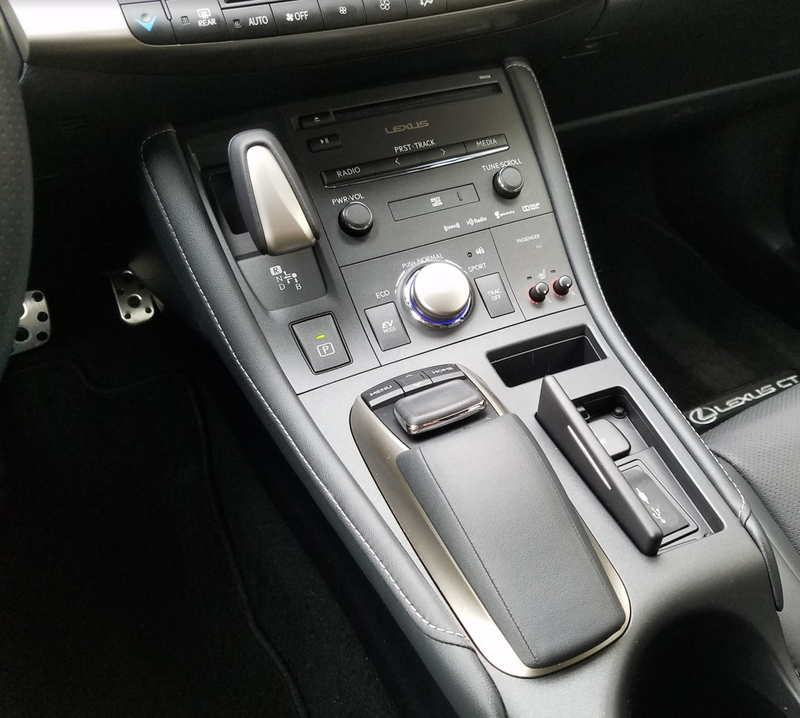 Although the infotainment system (which incorporates a CD player) includes volume and tuning knobs, most other adjustments are made through the console joystick controller and dash screen. This, too, is not optimal for convenience, though it’s something that likely gets easier with use and familiarization — the latter of which may require some consultation with the owners manual. Our experience with Toyota hybrids is that they deliver what they promise in terms of fuel economy, which is stellar. Yet even though the CT 200h starts out EPA rated about 10-mpg less than the larger Prius, our test car didn’t even manage to hit those diminished numbers. Granted, it was driven in very cold weather and often for short trips (the combination preventing the engine from warming up for best efficiency), but our 30.2-mpg average in mostly city driving — an impressive figure for virtually any other car — was still a bit disappointing given the CT’s 43 city/40 highway/42 combined EPA rating. The F Sport trim package has done well for Lexus in its other model lines, but it seems a little out of place here — kind of like the CT 200h itself. 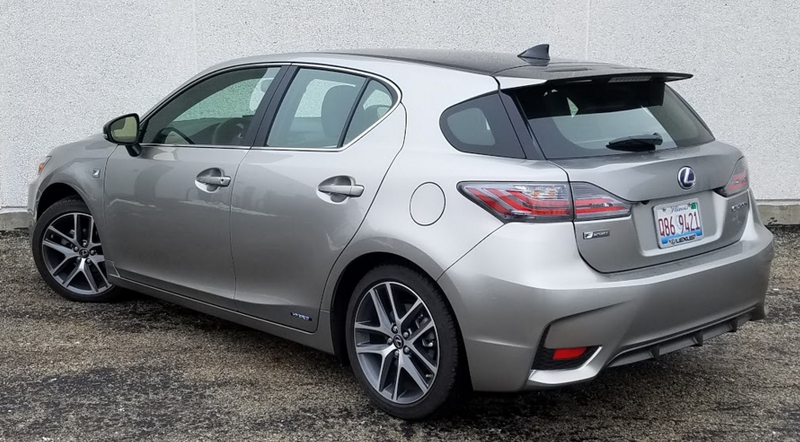 While it’s nice Lexus offers a distinctive hybrid (its body is shared by no other Lexus or Toyota product), it’s a bit difficult to view this little hatchback as an upscale entry … unless you look at its window sticker. Options added nearly $10,000 to our tester’s base price, a figure that could be trimmed by choosing a less adorned version. But even that would be a hard sell against a like-priced Prius. 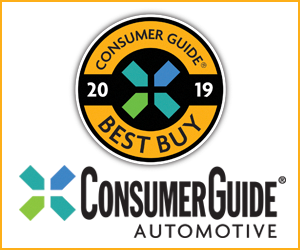 Perhaps not every Lexus CT 200h will be equipped like the one that Consumer Guide® editors sampled, but CG’s tester topped out at $41,795 with delivery and options that included the F Sport Luxury Package. 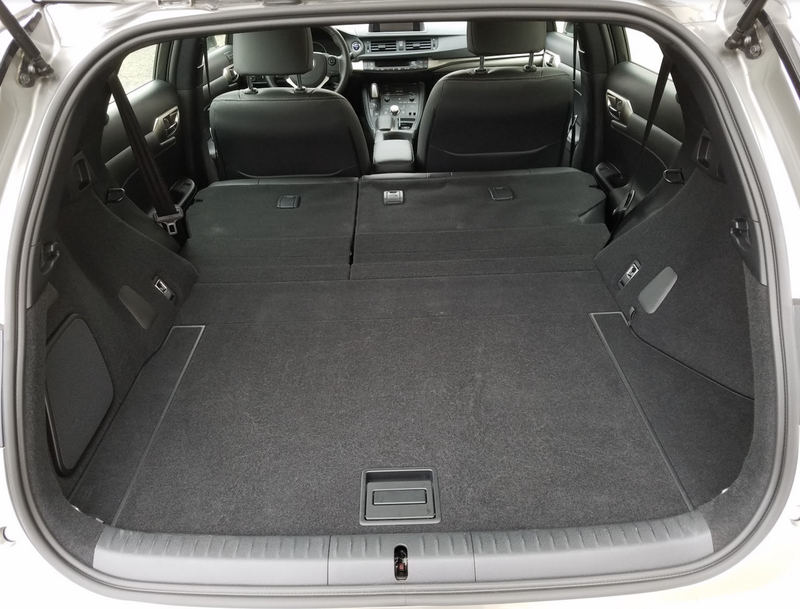 For that kind of money you get a genuine “hot hatch” compact—if you buy a Volkswagen Golf R.
Rear seat backs fold flat only if the headrests are removed or the front seats are far forward, but do that, and cargo space is quite good, and there’s more under the floor. First and foremost, the CT 200h is a hybrid, with family ties to the Toyota Prius, so fuel economy is the name of its game. EPA ratings of 43 mpg in the city and 40 mpg on the highway sound pretty good for a luxury-nameplate car. This reviewer’s real-world experience wasn’t that good, though. Driving during a period of battery-sapping cold days, some with temperatures in the single digits above zero, he averaged 33.2 mpg from a 175-mile test stint composed of only 40 percent city-type driving. In a way, slapping an F Sport badge on a CT 200h has a certain sense of nostalgia to it. It’s a little like pulling on one of those cheesy old T-shirts with the ripped six-pack-abs-torso graphic. It’s arguably among the sportiest of hybrids — particularly in our tester’s F Sport guise — but the CT 200h sacrifices some practicality, at least compared to its less-expensive (and quite excellent) Toyota Prius cousin. Written by: The Daily Drive staff on January 12, 2017.on January 19, 2017.